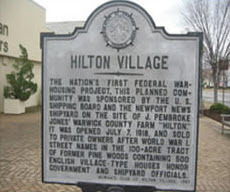 Hilton Village located in Warwick County on the outskirts of the independent city of Newport News in the Hampton Roads region of Virginia was the United States' first Federal war-housing project established during World War I. The planned community was jointly sponsored by the U.S. Shipping Board and the Newport News Shipbuilding and Drydock Company. It was built on the site of J. Pembroke Jones' farm "Hilton." Hilton Village was opened July 7, 1918. The street names in the 100-acre tract of former pine woods containing 500 English village-type houses honor government and shipyard officials. The houses were sold to private owners after the war. The former Warwick County and the City of Newport News voted to consolidate (merge) in 1958 to form the current expansive city known as Newport News. In 1917, during World War I, the war effort is in full swing. 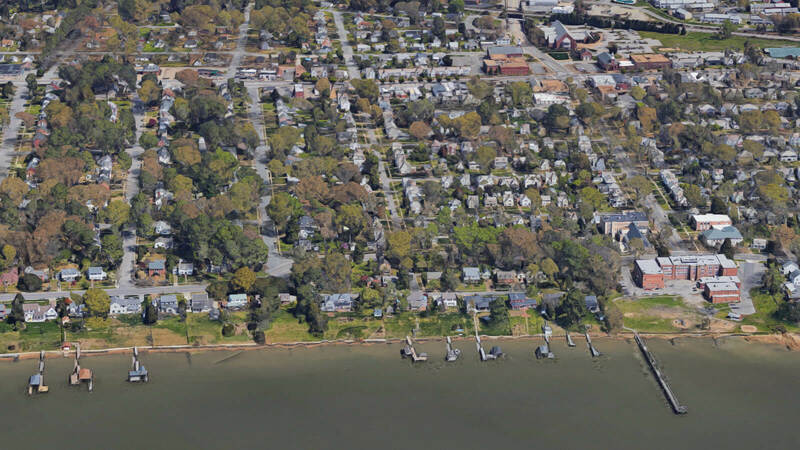 Newport News Shipbuilding has many contracts to build ships and is hiring; shipyard workers are being housed in overcrowded and/or temporary quarters and the community of Newport News is facing a severe housing shortage. This led to the birth of Hilton Village. In fact, the housing shortage was so severe that Newport News Shipbuilding president Homer L. Ferguson traveled to Washington to emphasize to congress its impact on ship construction, and thus the war effort. Immediately after his appearance, the United States Shipping Board was provided funding of $1.2 million and authorization to create a comprehensive emergency housing program. Hilton Village was the first project for the emergency housing program. About three miles north of the Newport News City limits, in Warwick County, land known locally as the Darling Tract was purchased. This consisted of about 200 acres of woodlands and, located on a bluff overlooking the James River, the pre-Civil War homestead was named "Hilton". In 1917, one of the finest town planners of the era, Henry Vincent Hubbard of Harvard University, was employed to plan the community; Francis Joannes was hired as the architect. The architects met with the wives of shipyard workers. Based on their input 14 house plans were designed for the projected 500 English village-style homes. Clearing the wooded site began on April 18, 1918 with a hoard of laborers and mules. By the time of the Armistice in November 1918, almost 200 homes had either been completed or were substantially complete and more than a dozen families lived in Hilton Village. Hilton’s formal dedication was held on July 7, 1918. The Hilton Elementary School was completed in 1919. Scaled back to 473 homes after the end of World War I, by the end of 1920 all the homes had been completed and were occupied. The cost estimate for site development and building each house was $3,200. The average annual salary at Newport News Shipbuilding was between $1,400 - $2,000. Hilton Village has maintained its close knit neighborhood quality and is a desired location for families, empty-nesters, retirees and businesses. In 1921, Hilton Village was purchased from the government (the United States Shipping Board) by Henry E. Huntington, chairman of the board at the shipyard. He formed the Newport News Land Company, which ran Hilton as an adjunct of the company. In 1922, some of the houses were put up for sale, and Hilton Village gradually became a community of homeowners. On January 1, 1945, the Warwick County government moved from Lee Hall to Hilton. 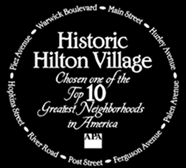 The American Planning Association (APA) announced in 2009 that Historic Hilton Village has been designated one of 10 Great Neighborhoods for 2009 by APA's Great Places in America program. APA Great Places exemplify exceptional character and highlight the role planners and planning play in creating communities of lasting value. APA singled out Historic Hilton Village as an iconic example of timeless neighborhood planning concepts espoused by renowned British urban planner Sir Ebenezer Howard. Historic Hilton Village was the first of approximately 100 federally financed and constructed housing projects during World War I, yet still remains an exemplary national model for communities wanting to plan and build compact, pedestrian-friendly places.